I have been on a HUGE Drunken Noodle kick lately. I mean Huge! I literally think about it all the time, when I get up in the morning, sitting at my desk at work, walking home, etc. It’s all thoughts of drunken noodle. I’m trying to limit my consumption since I’m pretty sure it’s chock full of salt but last week I had to cave in. The desire was too great! I decided to try out a different place in my neighborhood Lantern Thai. I’ve had lunch from the original location in Brooklyn Heights before and thought it was pretty good. This location has a much hipper vibe about it. Long lights hang from the ceiling and fake trees fill in the corners. The front opens up when the weather is nice with ample outdoor seating. We got a seat right by the open windows and placed our order. 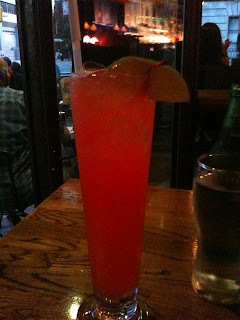 I started out with a Mai Thai. Just some updates from the past weekend. Friday night we went out in the East Village a bit and ended up grabbing some food from Mamouns to take home. I had always heard these were good but I was surprised to find out just how good they were! We both got the lamb shawarma sandwich and they rocked. For $5 it was a ton of food stuffed inside the warm pita. I definitely see more of these in my future. Saturday we finally made it to Governor’s Island. This place is amazing. The architecture, the open space and the views of the city make this truly a special place. I am so upset I didn’t make it sooner. If you haven’t had the opportunity to check it out yet- go! For a Christmas present two years ago Mr. T and I got tickets to see Garrett Oliver, Brewmaster of the Brooklyn Brewery, teach a class on beer at the ICE. We had a great time and learned a lot of good info about the beer making process and the different styles around the country. So when I saw he was doing a class again, this time with cured meats and beer, I knew we had to go. We got there about 10 minutes early and got a seat at one of the front tables. 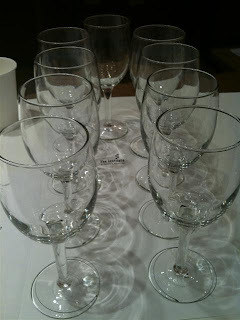 The session was set up just like the last one with nine wine glasses in front of each person for tasting. There was also a sheet on the table listing all of the beers and meats we were going to try throughout the evening. Mr. T and I have gotten a lot more into beer since the last class and unfortunately there was only one beer on the list, the Smuttynose Baltic Porter, we had never tried before. I guess we know too much about beer now! We swung by Live Bait the other night for some quick bites before an event at the ICE. My parents were still in town so we were basically just meeting up with them for a little bit before heading to our class. 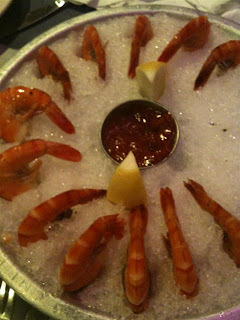 We started with a huge platter of peel and eat shrimp. The shrimp were perfect in texture and the meat was slightly sweet. These shrimp were surprisingly awesome. I wasn't expecting much from this divey bar but these really delivered. We also got an order of the Honey BBQ wings. These were surprisingly tasty as well! The wings were a good size and the sauce had a nice sweet and salty flavor. The sauce was a tad on the thick side but overall these were some really good wings. I always seem to overlook Live Bait but it's a pretty good neighborhood spot for some fun drinks and appetizers. It was absolutely gorgeous yesterday and Mr. T and I got to spend it doing exactly what I like most. Eating and drinking of course! I bought tickets earlier in the week to Taste of the West Village- a food and drink event to raise money for some of the city schools. For $25 each we got 10 tickets to spend as we like on food and drink. We got there right at 12:00 and we were literally the first ones there. The event was held in a small parking lot on Greenwich Street with tables set up for food and extra space so people could mingle around and enjoy themselves. They had a live band playing and even a place to play Corn Hole! Okay I will tell you about the food a little bit but this is actually the reason the event was such a good deal. 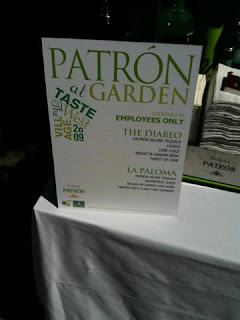 Bartenders from Employees Only were on hand serving up two of their cocktails The Diablo and La Paloma. Saturday I awoke to my birthday and I was actually feeling pretty good. I haven’t had many good birthdays the past few years but I was really feeling positive and free today. My parents were visiting, I had just gotten engaged, it was a good start to a new year. 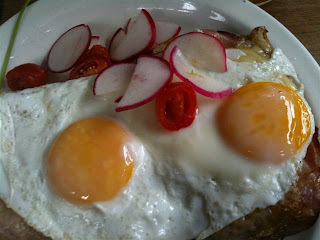 I have been dying to go eat at Locanda Verde for weeks now. Pictures of the food are pretty much all over the Internet and every single dish makes me want to lick my computer screen! I was lucky enough to score a brunch reservation on my birthday so my parents picked me up and off we headed down to Tribeca. My parents were in the city for a few days last week for a visit to check out the engagement ring and eat some good food. I had just gotten my birthday Patina gift certificate and decided this was a perfect opportunity to try out one of their new restaurants. For those of you that don’t know, as a member of Patina’s restaurant club they send out a gift certificate every year for your birthday. If you spend $50 at one of their restaurants, they’ll pick up the next $50. It’s a pretty good deal. 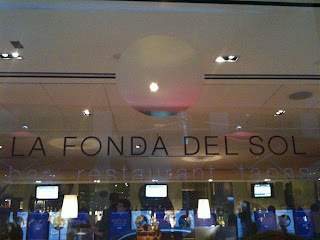 So I made a reservation at La Fonda del Sol for Wednesday night. Wednesday ended up being absolutely gorgeous in the city so when we arrived at the restaurant we asked to be seated outside. Luckily there was one table left and we got to enjoy the hustle and bustle of midtown. My Mom and I got some wine and my Dad tried out thier Mojito. Since La Fonda del Sol is a tapas joint we decided to just order a bunch of dishes and share everything. A Little Disppoinment with Co.
Mr. T and I stopped into Co. Pizza the other night to grab a quick bite and relax with a drink. I’m going to preface this whole review by stating that we have been having a little trouble making ends meet money wise the past few weeks, so we were hoping a pizza dinner would be an inexpensive night out (all those visitors we had this summer really tapped us dry). So of course once we sat down at Co. and saw the prices we realized that we were in a little too deep but we decided one drink each and one pie would have to be our limit. 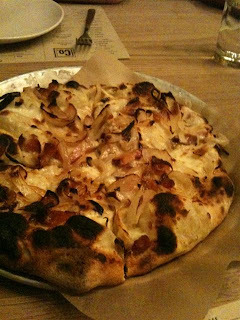 We decided to order the Flambe Pie which came with béchamel, parmesan, buffalo mozzarella, caramelized onions and lardoons. When this pizza came out I was super excited because the presentation was absolutely lovely. Big chunks of crispy onions, puffy charred pockets of crust and an incredible smell of garlic made this one multi-sensory experience to savor. After the disappointing stop at the Cowgirl Sea Horse I felt completely unsatisfied. 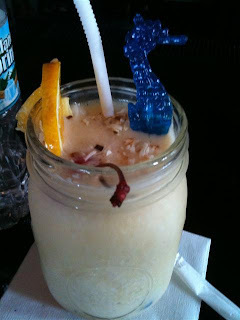 I had been craving some kind of fruity drink to celebrate the end of summer and my Pina Colada did not fit the bill. We decided to head out of the Seaport area and back towards home so we walked through Chinatown and the Lower East side until eventually ending up right outside Union Square. This is when I knew where I could get my fruity drink. Otto’s Shrunken Head!!! I had never been to this place before but I’ve always wanted to go. I knew it wasn’t going to be awesome or anything but who doesn’t love a tikki bar once in a while? It was still early when we got to Otto’s around 6:00 pm and the place was pretty empty. The only people at the bar were people who...well…looked like they probably never left the bar! Regulars I’d guess you’d call them. We took a seat and I ordered up my fruity cocktail the Pangs Punch. 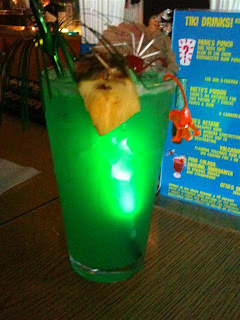 Look at the radioactive drink! All week we had been planning to spend our Sunday walking around Governor’s Island. We got up early Sunday and did some errands before heading down to the ferry. Apparently everyone else that decided to stay in the city for Labor Day weekend had the same idea. We got to the ferry building and it was packed!! Lines out the door zigzagging this way and that way. It was ridiculous! We quickly realized that if we wanted to get on that island we would have to be prepared to wait a while. Well that just wasn’t in the cards. Neither of us wanted to spend our day waiting in a line so we left. Instead we walked over to Stone Street and toured around downtown Manhattan a little until eventually ending up right around the Seaport. I was craving a fruity cocktail but didn’t want to get into the touristy crowd on the pier so we walked over on Font Street until we ended up at the Sea Horse Café. It was a wonderful sunny afternoon Saturday so we decided to enjoy some rays and have some beers out on the Frying Pan. For those of you that don’t know- the Frying Pan is actually an old lightship that was built back in 1929. It apparently had some good years of sailing before sinking to the bottom of Chesapeake Bay for 3 years. After it was salvaged the new owners brought it to NYC and made it into a bar. Now the boat sits on top of an old railroad barge on the West Side Highway. 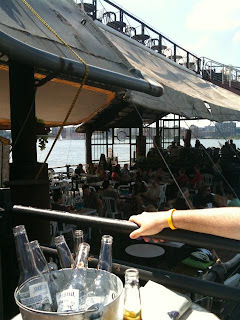 It has multiple decks filled with tables and chairs for sipping on some beers and enjoying the sun. We got a great table right in the corner and ordered some buckets of Corona and food. After about a 20 minute wait our number was called and we picked up our trays of food. I was feeling something green so I went for a small Chicken Cesar Salad. Anyone who knows and loves good beer has probably heard of the Westvleteren Trappist 12 before. It's almost always rated as the top beer in the world by beeradvocate, Ratebeer, etc. I've never had the good fortune of having this beer until last week. It's incredibly hard to come by since the Trappist monks only sell the beer at its Monastery gate and the inn next door. In 2009, sale of this beer was limited to one case per person. The monks brew just enough to sustain their small monastery so the beer is incredibly hard to come by. It is the only Trappist brewery left where the monks do all of the brewing. The bottles come plain like this with no labels at all. The only information about the beer comes on the cap. The number 12 doesn't refer to the ABV but to the number of weeks of maturation. That being said this is still a hefty beer ranging between 10.5 and 11.5% abv. I found myself in Coney Island the other day for work right during one of the nicest summer days we’ve had this year. It was 80 degrees, lots of sun and I could smell the ocean air in the breeze. I decided to take a quick walk down the Boardwalk for lunch, to one of the most famous spots on the island- Nathan’s. Nathan’s has been around since 1916 and it was started by a Polish immigrant. He used the little amount of savings he had to open up a small stand selling hot dogs. The hot dogs became such a hit people came from far and wide just to try them out. The rest is history. Now this is one of the most popular hot dog spots in the country. Look at the size of this place! Not just a little stand anymore. 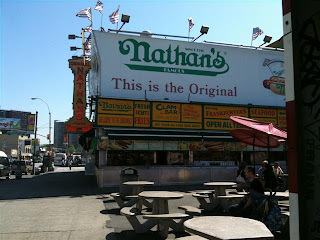 Now Nathan’s is home to the infamous hot dog eating contest every 4th of July and there are locations all over the USA. Quite a story.